Lupe Lovato is a Santo Domingo Pueblo jeweler who is best-known for his gorgeous necklaces of handmade beads. We have been offering his pieces at Chacodog.com since 2002. 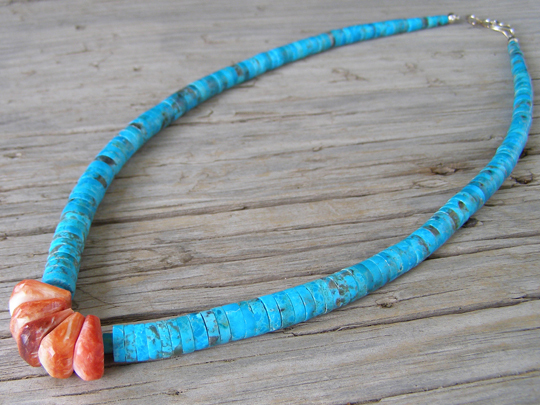 His beads are well-known for their smooth transition in size. These are hand-turned beads of stabilized Kingman turquoise strung on beadalon (nylon-sleeved braided stainless steel wire). These are the smallest diameter disk beads that Lupe uses to make this style of choker necklace. Five graduated tabs of red spiny oyster "corn" highlight the center of the strand. This is a smooth strand of handmade beads in a lively shade of blue which is mottled by matrix.